Yippee Skippee!! It's time for the nail files! I've been a nail polish enthusiast for a very long time. Like, a really long time (not that I'm aging myself in the slightest with that italic, haha). Being that I'm not really a fan of pale pinks and any kind of red, my polish options were always somewhat limited. Back in the day (holy moly, I just can't stop, can I? ha!) I had two options for fun colours: Hard Candy, which was very much NOT available at walmart, and F/X, a custom polish brand found in its downtown Toronto store (think Betsy Johnson merging with vintage style). Both polish brands cost about one kazillion dollars per bottle, so I had to be very selective on what awesome, "unusual" colours I'd purchase. One of my favourites of ALL TIME, a glitter that I bought many, many bottles of was a bright blue sparkle by F/X. And when I say bright, guys, I mean it was briiiiiiight. Like the sun, only blue. 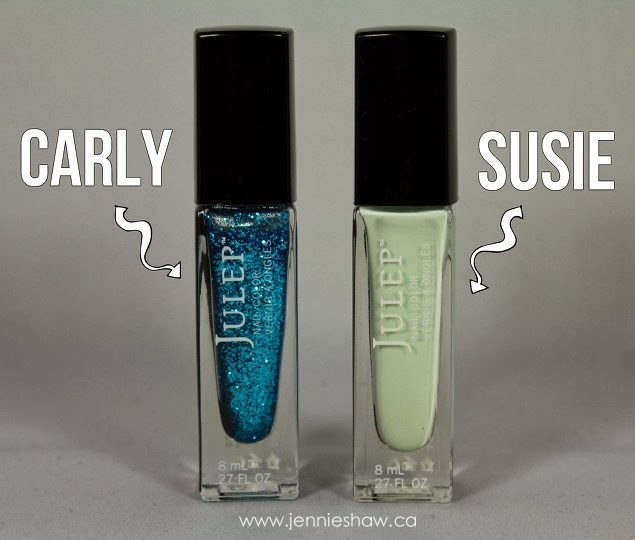 Anyway, that polish has been long gone for quite some time, which is why I just about lost my whole mind when I spotted an exact replica during Julep's warehouse sale. And when it came…well…let's just say that I may have hugged the bottle and spun around, dancing in my living room like I was Belle from Beauty and The Beast. Here's what I'm talking about…err…and the other polish I used for my flashy flashback mani, although, let's be real, there's only one star of the show here. Haha! Two coats of Susie on all nails, followed by a coat of quick-dry top coat. When the polish was totally dry (I waited 15 minutes), I put four strips of striping tape on each feature finger and then did two quick coats of Carly. Taking the tape off was kind of a beyotch because the sparkles didn't line up totally straight, so I used the end of a flat nail art brush to try and straighten them out. It sort of worked, but not really, so this is the kind of mani that's best looked at from farther away. You know, like a Monet because from far away, it's OK, but up close, it's a big old mess (bonus points if this made you giggle). Can't wait to see what you're all rocking this week! Link up and show off your pretties! I really like Carly, what pretty sparkles!!! Firstly, much love for the Clueless reference at the end. Like... MUCH love. Secondly, damn girl these stripes look perfect!!! Apparently YOU don't think they do. BUT THEY DO. Great blue sparkle. It truly is the star of the show! I'm really late today with posting. My computer has been acting weird today (more than usual). I love that look. With the glitter stripes. Cute nails! I love the colors & designs too! Thanks for hosting the link up and enjoy your evening.